I cannot figure out my relationship with Monday morning. On the one hand I am always behind. On the other, I see the week as full of infinite possibilities. Every week, this is the week I am going to get my act together. I am full of optimism and resolutions. This is the week I turn over a new leaf! This is the week I am going to get done everything I did not get done the week before. I am going to bake bread. I am going to pack our lunches the night before. I am going to get to Pilates class. This is also the week I resolve to study up on the Latin Mass because every Sunday I go and it flies past like a freight train and I am sitting there going, "Huh?" You should have seen me yesterday at church. Pathetic. And I had been out Saturday night to hear Jocko and had drunk too much red wine which did not help. This week I will drink less red wine. And I am going to take my vitamins. And walk. And plan in advance when I am going to go to my mom's and what I am going to bring. And keep better in touch with my Facebook friends. Plus this is the week I call the people at Capitol Records that my friend Mark was nice enough to give me the phone numbers for. Remember my friend Mark Heimback-Nielsen? He is the Capitol Records expert in California I got in touch with several months ago and he has been the greatest resource. Just last week Mark was interviewed for Clint Eastwood's new documentary on Johnny Mercer. That is how expert he is. That is a picture of Johnny Mercer up above. 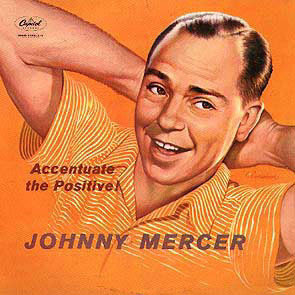 You cannot have too many pictures of Johnny Mercer! He was a Capitol Records artist the way Leonard Pennario was. What about Mercer Ellington? 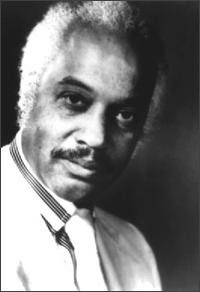 He was Duke Ellington's son. We need to call Capitol because evidence suggests that there is unreleased Pennario stuff in the vaults that they are hanging on to. Wouldn't it be wonderful to get our hands on that? That is the kind of thing I dream about. It occurs to me that the more behind I am in my life, the bigger I dream on Monday. Because there is so much to be done. I hung around the house most of the weekend working. I even blew off the St. Patrick's Day Parade! And of course I got less done than I thought I would. It is not that I did not work. I did! But it is such slow going. Great things take time and Pennario definitely falls under the category of great things. But not to worry. This is the week I will make inroads. Every Monday is like New Year's Day! Keep enjoying yourself while your young, plenty of time to finish the ironing once your an old lady. One question, do the people at your church dress as shabby as mine? Whats wrong with people, even Homer Simpson has his Sunday best clothes. I guess I am old and cranky now. "Because there is so much to be done", that is the story of my life also, every single day. I often say I would need at least a month off from work to even try and get caught up, but I am sure even that would not really come true. I have to believe someone may have left a nasty or very derogatory comment before that had to be deleted, which is really too bad that they felt the need to do so.